Kanye West visited the White House on Thursday for a lunch meeting with President Donald Trump. The rapper pulled up to the White House in a black SUV around 12:09 p.m. The meeting was scheduled to begin around 12:30 p.m. and was held in the private dining room of the Oval Office. Trump's son-in-law and advisor, Jared Kushner, and daughter and advisor Ivanka Trump joined them. West also invited Hall of Fame running back Jim Brown as his guest. Before sitting down to eat, the group gathered around the Resolute Desk and talked about North Korea. Trump said former president Barack Obama considered it one of the biggest problems. "One day. One," West said. "You solved one his biggest problems. We solved one of the biggest problems." He also said the president "saved the Earth, saved the planet." In addition, West weighed in on Trump's work on the criminal justice system. He also said a lot of people "tried to scare me to not wear this hat," noting his red "Make America Great Again" accessory. Still, the "Stronger" star said it "gives him power in a way." "My dad and mom separated, so I didn't have a lot of male energy in my home," he continued. "And also I'm married to a family where, you know, there's not a lot of male energy. It's beautiful though." In fact, he compared the hat to a "superman cape." He also made a comment about Hillary Clinton, claiming "I love Hillary. I love everyone, right?" He proceeded to speak for nearly 10 minutes on a variety of topics, including Trump, the 13th Amendment, sentencing, manufacturing and mental health. He told the president he's not bi-polar but actually has sleep deprivation. He also claimed to be in the 98th percentile in terms of IQ. He also called out Saturday Night Live, on which he recently appeared. "What I need Saturday Night Live to improve on and the liberals to improve on is if he don't look good, we don't look good," West said. "This is our president. He has to be the freshest; the flyest planes; the best factories and we have to make our core be empowered." After he was finished, Trump said the speech was "pretty impressive" and "quite something." West even hugged the president at one point. Before the meeting, White House press secretary Sarah Huckabee Sanders said the "topics of discussions will include manufacturing resurgence in America, prison reform, how to prevent gang violence, and what can be done to reduce violence in Chicago," which is West's hometown. In addition, deputy press secretary Hogan Gidley said the conversation will be centered on Trump's work to benefit all Americans, including urban revitalization, the creation of Opportunity Zones, new workforce training programs, employment, the creation of manufacturing jobs, potential future clemencies, massive violent crime surge in Chicago and ideas from meetings with African-American pastors. Before the lunch, Trump signed H.R. 1551, the Hatch-Goodlatte Music Modernization Act. Deputy press secretary Lindsay Walters described the act as a bipartisan bill that ensures artists who released records prior to 1972 are paid royalties for digital services. It also aimes to streamline the process for those services to obtain music licensing rights. Kid Rock, John Rich, Michael Love, Sam Moore, Craig Moore, The Beach Boys' Michael Love and The Doobie Brothers' Jeff "Skunk" Baxter are joined for the signing as did members of the Trump Administration and members of Congress. Trump spoke about the meeting during a Wednesday interview with Shannon Bream on Fox News. "I mean, I'm doing things for the African-Americans that have never been done by the Democrats and, as you know, Democrats really have had that vote. They've had that vote locked up. It's not so locked up anymore, you know, because I'm producing numbers that they were never able to produce," said Trump, who has repeatedly claimed the jobless rate among African-Americans has decreased during his presidency. "So, it's a great thing, and Kanye West saw that. 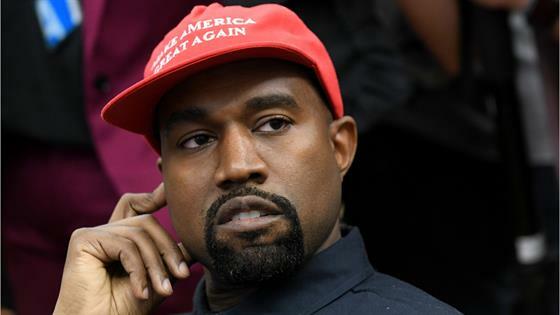 Kanye is a smart guy, and he saw that—and he saw that a long time ago." According to NBC, the unemployment rate for African-Americans has reached a new low under the Trump Administration; however, these rates have been falling steadily for the past several years. The commander-in-chief also described West as a "friend of mine" and spoke about their relationship during a separate Fox interview on Thursday. "I've known him a long time," the commander-in-chief said. "He's a very different kind of a guy, I say that in a positive way. He is a very different kind of a guy. Those in the music business say he is a genius. That's OK with me because, as far as I'm concerned, he is. When Kanye came out [a] couple months ago, something happened, my polls went up like 25 percent. Nobody [had] ever seen it. He has a big following in the African-American community—a big, big following. I think he has in a lot of communities, but the polls went through the roof." In addition, he said West is "respected" and is "really a great guy." "You know what he wants? He is not asking anything for himself. He doesn't say, 'Gee, I want to do this or that.' He is a private guy. He wants to help people," Trump continued. He also spoke about West's focus on prison reform—an issue the rapper's wife, Kim Kardashian, has recently championed. The Keeping Up With the Kardashians star spoke about her husband's visit to the White House at Tiffany & Co.'s Tiffany Blue Book Collection in New York on Tuesday. "He has a really focused mission on what he wants to talk about, and I think the White House is really receptive to his ideas—a lot having to do with the inner-city of Chicago. And, you know, that's a place that's close to Kanye's heart," she told E! News. "He really wants to talk about factories and building local factories for his clothes and shoes and getting formerly incarcerated men and women to work at his factories. I know that's really important to him and making that a standard for who he employs. I think that's really important, and I'm really proud of that." West has been vocal about his viewpoints on Trump. He's shared his political opinions on Twitter and referred to the president as his "brother." "You don't have to agree with Trump but the mob can't make me not love him," he once tweeted. "We are both dragon energy. He is my brother. I love everyone. I don't agree with everything anyone does. That's what makes us individuals. And we have the right to independent thought." He also frequently wears a "Make America Great Again" hat and sported the campaign slogan accessory while making a passionate political speech at the end of a recent episode of Saturday Night Live, for which he served as the musical guest. Kardashian has fiercely defended her husband's right to free speech. "Now when he spoke out about Trump...Most people (including myself) have very different feelings & opinions about this," she tweeted. "But this is HIS opinion. I believe in people being able to have their own opinions, even if really different from mine He never said he agrees with his politics." West also met with Trump in December 2016 after the presidential election. "I wanted to meet with Trump today to discuss multicultural issues," he tweeted at the time. He then added, "These issues included bullying, supporting teachers, modernizing curriculums, and violence in Chicago." The "Gold Digger" star also claimed he felt it "is important to have a direct line of communication with our future President if we truly want change." West isn't the first one in the famous family to visit the White House. Kardashian visited the White House in May to discuss prison reform with Trump. She asked him to pardon a grandmother named Alice Marie Johnson, who was serving a life sentence for a first-time, nonviolent drug offense. Johnson has since been granted clemency.